When you work at your vocation intensely, you develop a deep understanding of your process. Recognizable habits start to surface and cycles become apparent. You begin to note things, like how you approach and actualize your ideas. You begin to know what kind of creator you are and how you drive your creativity. I’m the kind of creator who starts with a plan…but is not afraid to change it. One of my studio “rules” is to never become too precious with an idea or piece – I must remain open to experimentation and play and not worry about “ruining” the piece if I take it too far. The fabrication of each piece requires its own unique journey. I like to think of the journey as a creative road trip. Occasionally a piece will come together quickly, all of the elements falling into place in an almost supernatural way, with the end product looking precisely how I imagined it would. This would be the direct route. Most often a piece will go through several mutations before it feels truly finished. I think I know where I’m going but then I get lost on some metaphorical back road. Suddenly I realize I’m far off my intended path but it’s all good because, metaphorically, I stopped for a bite to eat and experienced a really kitsch-cool attraction. This, my friends, is the scenic route. Creating via the scenic route involves having to continually make adjustments as the piece evolves and layers of meaning start to gel. All my sculptures begin with a basic soft-body figure. As the work progresses I may have to add some infrastructure if it turns out that arms, legs, hands or heads are required to hold a gravity-defying pose. Adding the internal support midway through creation means that I am ripping out seams, taking off heads and hands, unstuffing, adding wire armatures, restuffing, and then stitching everything back up. I have no doubt that Dr. Frankenstein would wholly approve of my process. 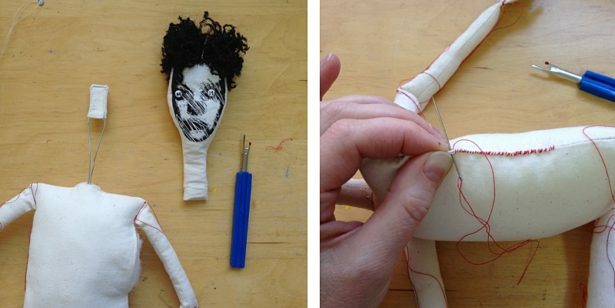 When I “operate” on a figure I stitch them back up with red thread. If you were to disrobe many of my pieces you would see multiple “scars” from the history of surgeries that I’ve performed on them. Every so often this give-and-take process gets carried to a meta degree. I’ve had realizations about pieces after they’ve been officially finished (and exhibited) and needed to rework them. I’m Not Sure A $120.00 Purse Should Do That is one such piece. I’m Not Sure…as exhibited in 2006 (left). On the right, I’m Not Sure, etc., in 2007. Originally shown in 2006 in a simple seated position, I reworked the piece in 2007 to have her lying on her back à la gyno-examination with a continuous roll of cash coming out of/going into her crotch. Doing so gave the artwork the sense of violation that I hadn’t quite captured previously and increased the mystery; what exactly was it the purse should or should not be doing? Another reworked piece is Great White Expectations. Great White with Self-Fish in background, 2007 (left). On the right, Great White Expectations, 2011 (photo credit: Kenji Nagai). 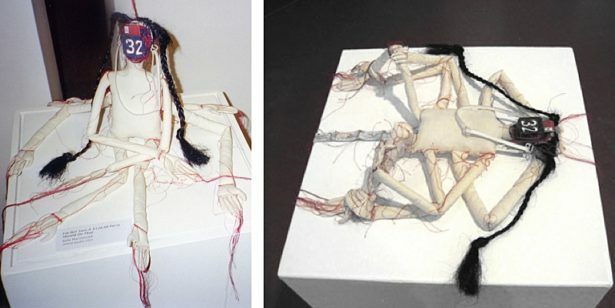 Finished (or so I thought) in 2007, this artwork was first exhibited on a doll stand with the abbreviated title of Great White. I wasn’t entirely happy with the display of this piece and in 2011 added internal and external armatures that allowed it to be self-supporting (I continue to show this piece in tandem with Self-Fish. Doing so gives me the opportunity to play both the titles off each other, which adds another layer of meaning: Selfish With Great White Expectations). Sure, taking the time to consider a piece fully before I begin construction might save me labor, but I wouldn’t consider altering my process – not even for a moment. Why? Because making decisions and solving creative problems on the fly has regularly netted me some pretty awesome results. Results I know that I wouldn’t have come to had I kept to a fully formed plan. Results that come from spending time with the piece and understanding how it wants to be finished. Experience has proven to me that the visual rewards of working this way can be potentially greater than if I had taken a more direct route. That makes the extra effort worthwhile. You see, although my process is more work, and takes longer, I don’t consider it to be a linear two-steps-forward-one-step-back scenario. Every step – the creation and the destruction – is forward momentum. Whether I’m working or re-working, it’s all progress on the road to creating the strongest artwork I’m capable of. Process is a road trip. Do you choose a direct route that will get you to your destination quickly? Or do you choose the scenic route with its options, picturesque views, and spontaneous discoveries? Please share your experience in the comments.